Are you seeking to be back at your best or even better? Getting back to your best may simply mean that you're now not at your best because you have sustained an injury that's likely to keep you sidelined for some time. Maybe this injury is in the same region as previous injury. You may now be thinking you have a weakness in this area, and it may even plague you throughout your sporting career, even cutting your longevity in the sport, and limiting the potential you have to have a long and outstanding career and something you were born to do. Maybe you are a fast bowler, born to wear the "baggy green", and recurring injury is holding you back. You do all the training you're supposed to do, following everything to the tee and still you get injured. You're doing more than everybody else just to make sure, you look like you're fit, and when you're pain free you're form is superb. Does this sound like you? So why is it all going wrong for you? Is your vulnerability to breakdown in your genes? Do you need to alter the bio-mechanics of your bowling action to reduce the forces that repeatedly cause your breakdowns? Do you need to be fitted with different equipment, padding, etc. to re-align your skeletal structure that either absorb or redirect those injury inducing forces on your body? You're probably interested in reading this because you're on the sideline right at this moment. And if you're not on the sideline licking your wounds, unless you understand and take on board the principles I shall outline, there's a good chance you will be. Now you want to know how you got an injury, how long its' going to keep you down, and how much ground you are now losing because someone else has jumped in to your spot. Let's talk plain and simple about injury. Here it is a thorough understanding in plain English. "Injuries are produced by force....a force that exceeds the structural integrity of the body (your body). When a force is encountered that exceeds the breaking strength of the body, than an injury literally must be produced. The strength of the body that permits the injury. Obviously, injuries can be avoided by either of two methods. By increasing the strength of the body. There is nothing complicated about these conclusions, they are plain and simple, but correct. What has led you to injury? Is your bowling action all to blame? After all, we need something to attribute to explain why you are breaking down. It couldn't possibly be that you are simply not strong enough. It couldn't possibly be that we have under estimated the importance of strength training as the prescription that protects you from injury. We have to analyze your bowling action over and over, then we have to correct your running bio-mechanics, but we never just think that you're just not strong enough in the first place. You're already doing weights and strength training exercises, so it couldn't be that. Or could it? Are the methods and choice of exercise movements mis-instructed? Are you failing to receive the full and proper benefit from your strength program that should protect you from injury? Nowadays, everybody understands the value of strength training, right? Wrong... dead wrong. Relatively few people have permitted themselves to be convinced, although hesitantly and even fearfully, that there might be some value to strength training in a few cases in some sports. While the vast majority of people connected with sports in any capacity remain almost literally scared to death of strength training, they are still convinced that increasing the strength of an athlete will somehow hurt his performance. In the meantime, it has been clearly and repeatedly demonstrated hundreds of times, with no single exception I ever heard of and no exception I would believe unless I saw it myself, that proper strength training will markedly improve the performance of any athlete in any sport. And the great athletes are the ones who have the most to gain from strength training... and are the most unlikely to use it; having been falsely convinced that it will hurt them. Proper strength training may improve the functional ability of a 'clod' by as much as 50 percent... but he will still be a 'clod', and will still be run over by untrained athletes who have all of the natural advantages that the 'clod' lacks. But even a 2 percent improvement in the functional ability of a natural athlete may well be the difference between a good athlete and a world champion. And just how much improvement can be produced by proper strength training? An impossible question, obviously. It depends upon the particular activity involved, the individual involved, and many other factors. But... in all cases, in all sports, there would be a measurable degree of improvement; to a level of performance that would never have been reached by that individual without proper strength training. And what degree of protection against injury will be provided by proper strength training? Another impossible question, since too many factors are again involved. But it should be obvious that a strong limb is far less likely to be injured than a weak one is, and it is well established that strength training increases not only the size and strength of the muscles, but the connective tissues and even the bones. Many sports doctors have plainly stated that 50 percent of all sports-connected injuries could be prevented by proper strength training; which is an opinion, an opinion that they have derived from the observations of literally tens of thousands of injuries that require surgical attention each and every year. If proper strength training was more widespread, then a reduction of even 10 percent would be an enormous step in the right direction. The proper tool for that giant step is in existence right now, and is being used by thousands of people... while being ignored by millions of other people. Strength training is the tool. Use it. An athlete has everything to gain, and nothing to lose except problems, and while it certainly will not solve all of his problems, would it not be wise for him to settle for a solution to some of his problems? So allow me to continue to spell it out to you loud and clear. A foot that slams into the pavement during running multiplies the force generated by 3-5 times the individual's body weight. Over time it results in tons of force that has to be absorbed by the human skeleton, the organs, muscles, and connective tissue. At face value, do you think your body is capable of such constant pounding or is supposed to absorb such forces, meanwhile maintaining your flexibility and muscle strength? Do you think that after all your bowling cricket balls at pace and all the running you need to do, that you can just get away with it scot-free? Lots of luck! I don't think so, and neither should you. For physiologists and specialists that they are, its' still possible they often forget the aspects of simple physics. G forces (gravitational) are a factor that is largely ignored as if it does not exist. When you wear protective equipment such as footwear, orthotics, pads, etc., you are doing so in an attempt to reduce the forces imposed upon your body. So reducing such forces is an approach in safety to protect you from injury. But very little in the way of worthwhile efforts is being made in the direction of solving the problem of injury in the only other way possible; not enough is being done to increase the structural strength of the body. Properly conducted exercise is capable of greatly increasing the structural integrity of an athlete... the result being an athlete who will be far less likely to suffer an injury. Proper exercise will increase the strength of the muscles, connective tissues (ligaments and tendons), and even the bones... and will also increase the possible range of movement or flexibility. All of these results will greatly reduce the chances of injury. Up to this point in time, most of the attention given to exercise has been for the purpose of increasing functional ability... hoping for increases in strength or speed, or both, and exercise is certainly capable of producing such results; very worthwhile results that will improve the performance of any athlete in any sport... but exercise can (and should) produce these increases in functional ability while simultaneously reducing the chances of injury. Exercise can help prevent injuries... and exercise should help prevent injuries; but in practice, it sometimes causes injury and the blame for such caused injury is seldom placed where it belongs. Strength increases are stimulated by high intensity of work, and only by high intensity of work... a muscle must be worked to, or very near, a point of momentary failure. Strength is general, and contributes to any activity... but the applied demonstration of strength is specific. Learning to apply your strength properly in any activity requires skill training... not strength training, but skill training can come from only one possible source, the practice of the sport itself. If it were possible, which it is not, to design an exercise in such a way that it was nearly specific, then the use of such an exercise would hurt you far more than it could help you. And the closer it came to being specific, the worse it would hurt you. All intelligent coaches are clearly aware that practice carried beyond a certain point is of no value... that it may actually produce a reduction in skill. Why? It is simply because a tired athlete changes his actions or style of performance. He begins performing his movements differently, as he must then compensate for his reduced strength, the unavoidable result being that he learns two or more styles of performance... a fresh style and a tired style, so to speak. He forms two or more sets of motor memories, which inevitably leads to confusion... and his performances suffer as a result. One of the oldest tricks in the world of sport, if bullfighting can be called a sport, is directly related to specificity. The night before a bull is to be fought, his horns are shortened by approximately a quarter of an inch... the next day, before he has become accustomed to his shorter horns, he goes into the ring to fight and die. And there stands the brave matador, being barely missed by the enraged bull... being missed by one-quarter of an inch, being missed by the amount of that bull's horns were shortened. The bull knows exactly where the tips of his horns are, if he must use them effectively. Shortening his horns by as little as a quarter of an inch will cause him to miss his target entirely. Did you ever get a grain of sand inside of your sock? It feels like a boulder and changes your entire style of walking or running... then, when you finally get it out, it turns out to be so small that you can barely see it. True specificity is just that, exact and hitting or missing the target can easily be determined by far less than a quarter of an inch or a grain of sand. An exercise that is nearly specific will simply mess up your skills... an exercise that is almost specific will have the same bad result. So do not try to be specific in your exercises... in any case, doing so is impossible, and the closer you come, the greater the danger of hurting your skill. Build strength in the best way possible... with little or absolutely no regard to how that strength is to be used; then learn to use that strength to your greatest advantage in the only way possible, by practice of the sport itself. Adding a few ounces to the weight of a cricket bat will do absolutely nothing in the way of increasing your strength for playing cricket... but it certainly will ruin your skill in batting. Adding a few pounds to the weight of a cricket bat will do very little in the way of increasing your strength... and it will still have some bad effect on your skill, although probably not as much as the previous example. So it is obvious that the closer we come to having specificity, the worse off we are... until and unless we have total specificity, in which case we are simply using the cricket bat in our usual fashion, which will increase our skill while doing nothing for our strength. Build the muscles that are involved in cricket whether as a batsman or fast bowler, or any sport... and build them the best and fastest way you can; without trying to be specific, without trying to duplicate the action of the sport itself. To build your skills... or even to retain your skills... you must practice any activity with total specificity. Anything else is counterproductive. Anything else will hurt you far more than it helps you. Now for the truth......... the truth of using exercises for developing tremendous in-roads into your structural strength. It takes heavy resistance to build strength... absolutely nothing else will do it. And... the faster you can move, the lighter that resistance must be. It is utterly impossible to move a heavy weight rapidly... you can throw it, but you cannot lift it; and throwing weight will not build strength. In fact, simple common sense also makes it obvious that a stronger man is less likely to be injured in any given situation... and that a more flexible man is also less prone to injury. An injury occurs when a force is imposed upon a muscle (or a joint) to the degree that the force exceeds the breaking strength of the body part, the muscle or joint. That much is undeniable... and thus, it follows that the injury would not have occurred if the breaking strength had been greater than the force. If a rope has a breaking strength of 100 pounds, then it will not break as a result of 50 pounds of force. But if its breaking strength is only 40 pounds, then 50 pounds of force must break it. A coach can do little or nothing to reduce the forces that will be imposed upon his athletes on the field. But, he certainly can increase the breaking strength of their muscles and joints. In some cases, the forces will be so great that no possible level of human strength would be high enough to prevent injury... but even in these cases, the extent of the injury may well be reduced as a result of exercise-developed strength. Thus, exercise will reduce the level of damage in many cases... as well as prevent injury in many cases. So much for preventing injury... even in the lack of statistics to prove the value of exercise for the purpose of preventing injury, it is obvious that exercise does help prevent injury, and it also reduces the extent of damage in many other cases. Now let's just re-track for a moment, and explain what is meant by the claim that "It takes heavy resistance to build strength... absolutely nothing else will do it." The term heavy resistance is as it relates to you. I repeat, it means heavy resistance to you. The expression "heavy weights" turns people off. They imagine some grossly excessive load far beyond its practical use being used and leading into "bulking" you up where you have your natural action or style impaired, resulting in you sacrificing suppleness in your action or style. So please understand when I use the term heavy resistance, it applies only as it relates to you. Heavy resistance to you may be light resistance to someone else, or conversely heavy resistance to someone else, may feel light in resistance to you. It matters not at all how hard it feels... all that matters is the force in relation to the breaking strength. Since we are never aware of the exact momentary breaking strength... all we can do is reduce the force as much as possible while still working all the muscles as hard as possible. If a fast bowler running in to deliver the ball at the pace say 135kph, with his momentary level of strength ability to bowl is at 135kph... and if he actually bowls at 135kph... then he will be working as hard as he can at that point in time... and he will also be producing maximum possible force. And if it happens that the momentary breaking strength of his muscles or joints or tendons is below that level, say at 125kph bowling speed ... then he will injure himself. Soon enough he will injure. We might not be able to predict exactly when, but he will injure. Under these circumstances, injury is unavoidable. But instead, if the same fast bowler ran in and delivered the ball at say only 120kph... and if he performed many deliveries at this 120kph pace ... then he would probably never produce more force than his breaking strength could withstand, in other words the forces on his body at this level would be less than the breaking strength of his muscles, joints and/or tendons... and the injury that was unavoidable when he was bowling at 135kph is thus avoided. In the case of the fast bowler, I am not suggesting we limit the pace with which he can bowl repeatedly to avoid the inevitable onset of injury. My point is this.... Exercise builds strength by exposing muscles to an overload. So build your strength far beyond the limits of your normal activity. Build your strength that allows you to bowl at that 135kph all day, every day, and in any possible conditions especially hot, dry and dusty temperatures. You can then perform well inside the existing levels of your reserve ability, and you can therefore perform at your best over very long periods. Why does the sport of cricket here in Australia entertain the "Rotation System" especially within it's' pace bowling ranks? It's because they want to keep their fast bowlers "FRESH". And why do they want to keep their fast bowlers fresh? It's because they are afraid they will get injured, plain and simple. It's not because they don't want you to bowl, and keep you from doing what you're good at, and love to do, and indeed should be doing. It's the injury thing. They haven't found the answers to the problem. Otherwise it wouldn't even be discussed. If no one got injured, no one would be talking about it. And no fast bowler would ever need to worry about maintaining their form and consistency, due to some arbitrary rostering system that's been introduced to offset you're perceived over loading. If you have the form and consistency and you're good enough, you should be picked. It's as simple as that. Fast bowlers do not need to be wrapped in cotton wool. They need to be strong. They need to be un-bendable, they need to be un-breakable and it can be done. This stereotype still exists in the minds of most people including coaches, medical experts even many fitness professionals that weight training, gym work call it what you will, builds bulging muscles that equates with a stiff, slow, and probably clumsy individual. At what point can strength training be taken before it affects your agility and ruins your bowling action or the way you swing a bat or a golf club. The run-up and delivery action for the pace bowler or the swing of a professional golfer can be so precise that coaches are literally frightened of this relationship of muscles strength development and loss of skill. Have you ever heard the comment, well now we've fixed the injury problem? They've become so muscular but they can't bowl anymore or they can't swing the golf club like they used too. They've lost that timing and precision that comes with bulky muscles. Strong muscles can be produced and at the same time increase flexibility. It is certainly true that some individuals with large muscles do lack a normal degree of flexibility... but in the vast majority of cases, the size of the muscles has very little relationship to the existing degree of flexibility. As a fast bowler, you can build strong muscles in a fashion and increase your flexibility at the same time, producing favorable results without any skill loss. It must be clearly understood that the strength of the muscles is the only really productive factor involved in functional ability... it's your muscles that produce movement... your muscles perform the work... your muscles are the only source of power for any purpose. In effect, and in fact, the muscles are the engine of your body. Without the strength of the muscles an individual would be utterly helpless, literally unable to move. However, in the face of the previous clear and undeniable statement, it still remains true that an enormous number of coaches and athletes remain almost literally afraid of their muscles. Failing to understand the simple cause and effect relationships involved, or still believing a number of thoroughly disproved myths, they look upon the development of muscle strength as something to be carefully limited, sometimes avoided. So what do I have to do about it, you ask? What is the Chevell method? What exercises do I need, and exactly how do I perform them? Are your methods any different to how I've trained before? The answer is clearly yes, they are. I became very disillusioned more than 30 years ago with the repeated injuries that I and nearly all fast bowlers experienced, despite the fact that we followed fitness guidelines for fast bowling. I knew innately something was wrong, so I set about finding the answers and I have. I am happy to share my knowledge and experience with you, and teach you how. During their careers I have worked with former Australian cricket captain Mark Taylor and fast bowling great, Glenn McGrath. Mark Taylor an opening batsman, and not known for his athletic ability affectionately nicknamed "Tubby" but having played over 100 Tests for Australia, one of our most successful captains of the game and a great slips fielder returned to me after he had lost his position as Australia's captain of the limited over's form of the game. Mark had worked with me on and off over the years, but in 1998 wanted to really give his fitness a go, and win back his form and confidence. Mark and I worked day and night during the off season that year. The intensity of his training, the sacrifices he made and the commitment he demonstrated was exemplary. He was rewarded. He batted over 12 hours in the searing heat at Peshawar; against Pakistan scoring 334 not out with the bat under enormous pressure in such conditions. Later that year he was awarded Australian of the Year, for his outstanding efforts and his selfless actions and leadership qualities putting his teams' importance in front of his own, in a sporting declaration that left the late, great Sir Don Bradman's' batting record also at 334 runs in tact. Mark acknowledges that the hard work and strength training that went into restoring his performance as batsman and team leader. At the time Mark was 34 years of age, that's not 24 years of age and his fitness carried him through the worst of conditions without the hint of mental or physical breakdown of any kind. 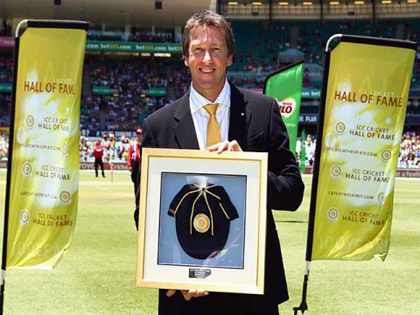 Likewise Glenn McGrath trusted in the Chevell method of fitness training from 1995 to his retirement in 2007. Glenn's longevity in the game was often attributed to his "easy action", rather than the fiercely dedicated manner in which he approached his strength and fitness. At the beginning of his career, he was very underweight and vulnerable to constant injury. He carried the nickname of "pigeon", which referred to his skinny legs like a pigeon. His nickname even suggested he was going to get injuries. He has since retired from cricket for five years and openly says that not only did the strength training he did under my training hold him together throughout his career, but now in retirement he carries no ongoing injury legacy of many years of the wear and tear that comes with over 12 years of international cricket in all its forms. In 2004, Glenn however did spend 11 months on the sideline due to operations to remove growth spurs on his foot. After two operations and lots of physiotherapy, things just didn't seem to be clearing up as they had hoped. Glenn's ranking with Cricket Australia had dropped from no.2 to no.11 that year. And the "experts" were starting to write him off. 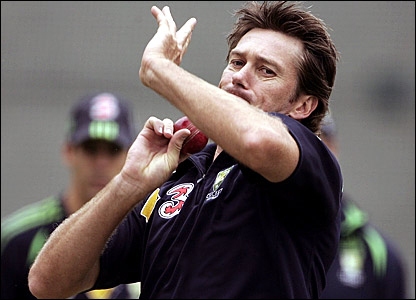 Both the media and former Australian fast bowlers could not see the way back for Glenn, then 34 years. Fast bowlers just don't come back after lengthy spells on the sideline at that age. But Glenn took on the re-building process like he did when he was in his early twenties, and after a couple of months of intense training he re-instated his position as the world's premier fast bowler. After all the very hard strength training and conditioning, Glenn had once again rebuilt his conditioning both physically and mentally, then went on representing Australia taking another 200+ wickets, even posting his career best figures of 8-24 versus Pakistan in Perth 2004, and proving his value with the bat as one of the distinguished tail enders who have scored Test 50's, with his 61 runs against New Zealand at the Gabba in the same year. Yes, the strength training the commitment to hard work, the kind of dedication it takes to bring the veteran opening bowler back from a career ending injury to career best performances with bat as well as ball. I withheld the contention with players like Mark and Glenn, that no matter whether your role was less or more reliant on strength and fitness, that if you developed your strength far beyond the limits of normal as relevant to for the forces that you needed to encounter as either a pace bowler or batsman, then injury would cease to be an issue. And you would maintain and continue your skill in the sport for as long as you held your love of the sport and wished to continue. When you sustain injury, you will almost certainly lose some of your momentum and confidence you had. And not to mention that someone else will fill your spot. As the title of Glenn McGrath's biography suggests, it's LINE & STRENGTH in favor of Line & Length!